Get the salt and grime out of your tires. As the warm months settle in, you are going to be cleaning more than your window sills. Spring cleaning is not just about removing clutter, but getting in the mindset to take on spring and summer. In addition to your home and backyard, a place that will surely need a solid cleaning session is your car. When summer hits, it's great to drive with the windows down and listen to your favorite song on the radio. Every day in the spring and summer months is like a celebration. But if you are driving around with salt stains from the winter on your vehicle's fenders and still have extra gloves in the back seat, then you are not as ready as you think. "You probably already have everything you need to effectively clean your car." If you typically go to a car wash, then you are used to the large machines and twirling wipers. These are fun to watch and certainly get the car clean, but they are also unnecessary. All you need is a bucket full of water, dedicated car-wash soap and a soft sponge or rag. If you have a hose that you can roll out to the driveway, that will be helpful. 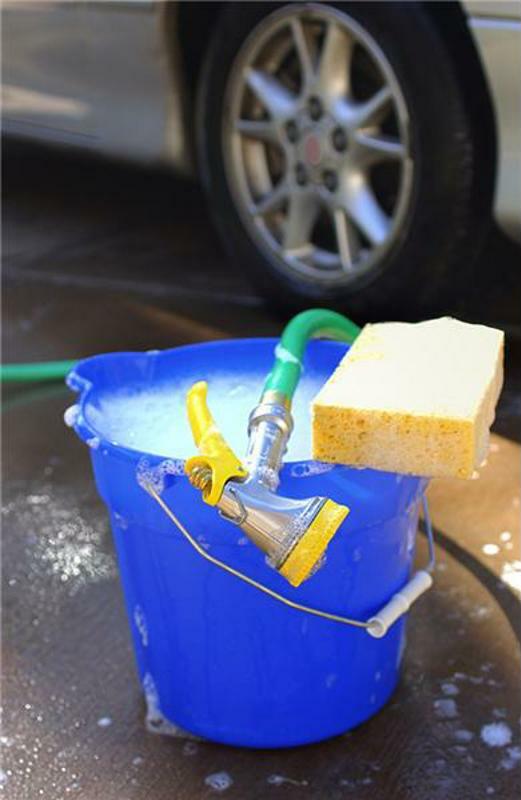 Wash your car like you would anything else with a sponge - until the dirt, salt and grime are gone. Your car is tough and can handle the pressure, so don't be afraid to go after the dirt. According to CBS, cotton swabs come in handy for getting gunk out of hard to reach places, such as side mirrors, around the windshield wipers or parts of the hubcaps. Additionally, you might have some bugs stuck to your windshield, as is all too common no matter where you have been driving. Spray the windshield with water and let it sit for a few moments before scrubbing it down. The moisture will pry those insects loose and make it easier to scrub the glass clean. A bucket and some soap and you are good to go. Some car owners are particular about their windows, and want them shiny and free of residue. It is hard to argue with that, as grimy windows can not only make the car less attractive, but can potentially be unsafe if residue obstructs the driver's view. But you still don't need to purchase a window cleaner just to get rid of streaks and dirt. If you find that water isn't doing a good enough job, go ahead and add a little vinegar to the mix. According to DriverSide, vinegar is an excellent choice for removing unwanted filth from your windows, especially if you are trying to get the insides of your windows clean. Vinegar kills germs and is an effective choice for eliminating whatever it is obstructing your view. When all is said and done, the inside of the car is less fun to clean than the outside. Scrubbing down the car may sound messy, but it's nothing more than soap and water. Hose it down and you are good to go. The inside is where you need to get on your hands and knees and pick up the old coffee cups, chip bags, unused napkins, dirt from shoes and whatever else happened to find its way into your car. This is where a vacuum cleaner comes in handy. According to Rodale's Organic Life, you should utilize the small vacuum heads that came with your cleaner. These devices allow you to get between the seat and the door, as well as behind the foot pedals. If you have floor mats, take them out and give them a good shake. Organize the glove compartment and get rid of anything that is old or unnecessary. It is easy to leave spots like that alone because you think to yourself, "Well, nobody can tell." But in case of an emergency or if you you need something from that compartment or middle console, the more organized they are, the easier it is to grab what you're looking for. Don't overthink cleaning your car. It doesn't require very special products (except car-specific soap), and you don't need to visit a car wash. You can get the same effect in your own driveway. And if you really want to go that extra mile, Reader's Digest noted hair conditioner will give your car that extra bit of shine you are looking for. Spring-clean your car today so it is ready to go out and enjoy the warm months to come.